The need for specialist oceanographic expertise first came to be recognised by the RAN in the mid 1950s, when the Fairey Gannet Anti-Submarine Warfare (ASW) aircraft was first operated from the aircraft carrier HMAS MELBOURNE. Meteorological officers onboard MELBOURNE provided tactical oceanographic advice to the Gannet squadrons, using bathythermographic observations of the ocean as the basis for sonar performance predictions. This advice was used by the Gannet crews to determine the optimum deployment of buoys fitted with hydrophones ('sonobuoys'), which they used in the acoustic detection and tracking of submarines. where 6., 6r are the angles of incidence and refraction. This means that sound in the sea is refracted towards areas of lower sound speed. The degree of refraction is also frequency dependent, being greater for higher frequencies. Snell's Law can be applied qualitatively, to understand the acoustic properties of the water column, and hence determine optimum tactics, such as search or evasion plans. It can also be applied quantitatively, in sonar range prediction models, such as the RAN's 'Tactical Environmental Support System version 2' (TESS 2). These models estimate detection ranges, based on ocean acoustics, the performance characteristics of sonar systems (such as operating frequencies, transmitted power, pulse length, processing losses and gains, etc), and a knowledge of target characteristics (such as target strength, depth, aspect, etc). Ray-tracing models are generally found to give good results at medium and high frequencies (above 1-2 kHz). These frequencies are typically used by active sonars, which transmit a pulse of acoustic energy, and detect its echo (as distinct from passive sonars, which detect radiated noise from a target). Active sonars are fitted in ships and submarines, and can be deployed from aircraft as sonobuoys or, in the case of helicopters, on winches ('dipping' sonars). duct. If the surface wind is light, surface losses due to scattering on reflection will be low, and very long ranges are possible. In order to take advantage of this ducting effect, hull-mounted active sonars in ASW frigates are generally designed to operate at frequencies which are high enough to be trapped by the surface duct, in order to maximise detection ranges against shallow submarines. Below the mixed layer, the water gets colder in the thermocline zone. Between the base of the mixed layer at around 30 m, and the base of the thermocline at around 100 m, the temperature has fallen by about 7°C (Fig. 24.2). This means that the sound speed will have increased by around 1.7 ms-1, due to the increasing pressure, but fallen by around 28 ms-1 due to the decreasing temperature. Overall there is a large decrease in sound speed, which means that acoustic energy will be refracted downwards. 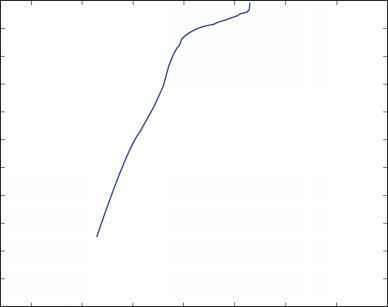 Between 100 m and 800 m, there is a drop in temperature of around 1°C per hundred metres (Fig. 24.2), which means that the sound speed will decrease by about 2.3 ms-1 per hundred metres. In the water column below the mixed layer, these various effects result in a downward-refracting profile, stronger in the main thermocline region, which means that acoustic energy will be refracted down towards the sea bed. If the sea bed is a good absorber of acoustic energy at the relevant frequency, acoustic propagation will be generally poor. Although the profile shown in Fig. 24.2 extends to around 850 m, the depth of water in this location is around 5,000 m. Below 850 m, there will come a point where the decrease in sound speed caused by the temperature lapse is negated by the increase in sound speed due to the pressure increase. In isothermal water, clearly the sound speed will increase with depth, and acoustic energy will start to be refracted up towards the surface. The consequences of an increasing sound speed at depth can be seen in Fig. 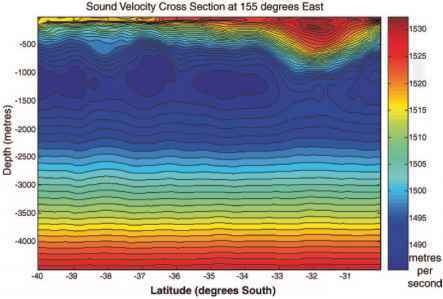 24.3, which shows a sound speed cross section through the Tasman Sea at longitude 155°E, from 30°S to 40°S. Temperature and salinity data has been obtained from the Ocean Forecast Australia Model (OFAM) (Brassington et al. 2007) for 31 March 2008, and converted to sound speed using Mackenzie's equation (Mackenzie 1981). There is a sound speed minimum at a depth of around 1,200 m, whilst below this depth, sound speed increases due to the small temperature lapse combined with the increasing pressure. At depth, the value of sound speed increases to be similar to that at the surface. The sound speed minimum at 1,200 m is associated with an acoustic channel, which is a very low-loss path. Above 1,200 m, sound tends to be refracted downwards, towards the channel axis. Below 1,200 m, sound tends to be refracted upwards, again towards the channel axis. A depth of 1,200 m would therefore be a good depth at which to position a hydrophone, in order to take advantage of this low-loss path in the acoustic detection of submarines. Where the sound speed at depth exceeds the value at the surface, a 'convergence zone' may be experienced. This is a ring around the acoustic source, typically with a radius of around 25 miles, where sound is focussed by a caustic effect. This focussing of acoustic energy near the surface provides opportunities for greatly increased ranges, and it is even possible for multiple convergence zones to be present, giving even longer range detections. In addition to the vertical gradients of sound speed discussed so far, horizontal gradients of sound speed are caused by temperature and salinity gradients associated with fronts and eddies, and these can also have a large effect on the acoustic properties of the ocean. For example, an anticyclonic (warm core) eddy will have warmer water towards its centre, therefore there will be a lateral gradient of sound speed associated with the eddy. An anticyclonic eddy can be seen in Fig. 24.3, at around 32°S, with an associated sound speed maximum at a depth of around 200 m. If a surface ship outside the eddy is searching for a submarine in the centre of the eddy, using active sonar, the sound will be refracted away from the submarine, reducing the probability of detection. Similarly, if the ship and submarine are on the opposite sides of an oceanic front, detection ranges will be much reduced. Acoustic effects such as the ones described in this section have been well known, and have been the principal concern of naval oceanographers, for a long time. Recent advances in operational oceanography are starting to provide the highly detailed oceanic data required to enable acoustic assessments and forecasts to be made at greatly increased spatial and temporal resolutions, suitable for tactical applications. For example, a submarine wishing to evade acoustic detection can use such oceanographic data to identify a location in the thermocline beneath the mixed layer, where the water is not too deep and the bottom is a good absorber of low frequency noise. This will ensure that its radiated noise is directed down to the sea bed, where it is absorbed, hence minimising counter-detection ranges. ASW aircraft can use high-resolution oceanographic data to identify near-surface sound channels, deploying the hydrophones on their sonobuoys or dipping sonars in the channel in order to achieve the greatest possible detection ranges. Knowledge of the location of fronts and eddies enables ASW frigates to design the most effective search plans, armed with an accurate assessment of detection ranges. These are just a few examples of how the wealth of oceanographic data now available presents abundant opportunities for the ingenuity of naval oceanographers and tacticians to be stimulated. As well as temperature and salinity, ocean currents also have an effect on ASW, and should be considered by naval forces. Submarines can take advantage of currents to increase their speed over the ground, whilst keeping their engines at low power (and therefore operating quietly). In some cases, particularly in the Australian region, ocean currents can run at 3 or 4 knots (Roughan and Middleton 2002), so this effect can be significant. 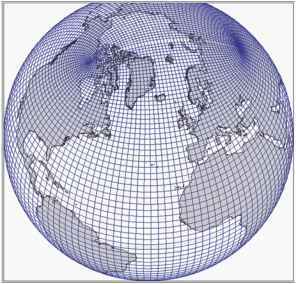 Ocean currents can also be taken into account in sonar range prediction systems, such as the RAN's TESS 2, since they affect sound speed. How does a submarine evade using oceanography?